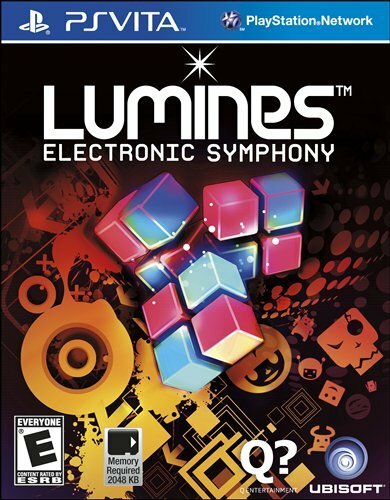 This latest installment in this kinetic puzzle game series, which began in 2004 on the PlayStation Portable (PSP), represents the first original iteration in about five years and offers amazingly colorful visuals, electronic music, challenging puzzle play, and deep statistics. 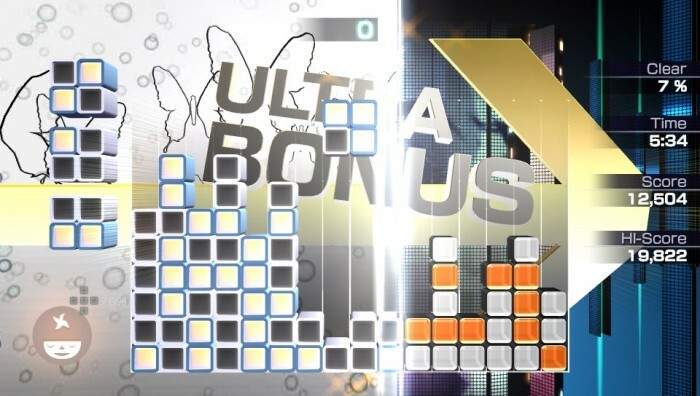 Lumines: Electronic Symphony mainly concentrates on single player modes while offering multiplayer and online elements. An in-depth player profile and deep stat tracking ensures all efforts are visible. The new experience points system rewards in several ways. 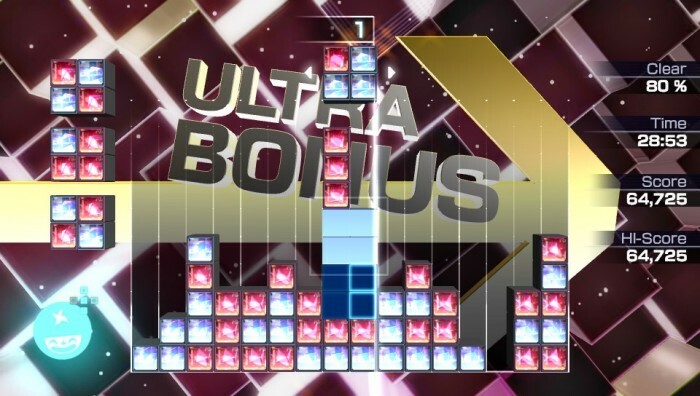 The best bonus rewards include clearing all blocks or one color – an attainable feat especially in the first few minutes, especially with the next blocks shown in the upper left screen. Chaining blocks together can also result in some huge combination bonuses, but timing is everything. One missed block drop opportunity or misplaced side can take you back to square one. 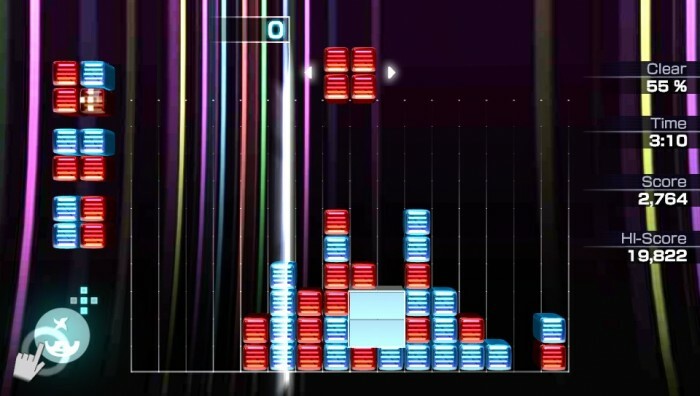 This PlayStation Vita launch game draws unavoidable comparisons to Tetris, but stands apart due to an extensive experience incorporating visuals, music, puzzle play, and statistics. This game features an all-new 3D graphics engine as player manipulate two-toned colored squares each with four smaller squares as they slowly fall down to the bottom screen. Players match same colors in square shapes while moving them down. The light white vertical guidelines are a definite plus. Players might have some adjustments here based on similar puzzle games (i.e. Tetris), but once the concepts click it’s a wild ride. Each level/stage has a distinct design and the upper right “clear” statistic lets player know how close they are to the next one. Players use avatars with specific abilities, which are located in the lower left of the screen. Each level/stage design contains sharp color schemes plus animated backgrounds in the background. Players can change avatars in the collection menu, which also listed their properties once unlocked. The great electronic music soundtrack including original tracks and 33 licensed tracks by musical artists including Aphex Twin, B.T., The Chemical Brothers, Deep Dish, Howard Jones, Ken Ishii, LCD Soundsystem, LFO, Mylo, and Pet Shop Boys. This soundtrack showcases definite ebbs and dips with great standouts including “Bang Bang Bang” and “4AM”. Changing rhythms and audio variety gives player a sense of discovery and journey as they solve these never-ending puzzles. 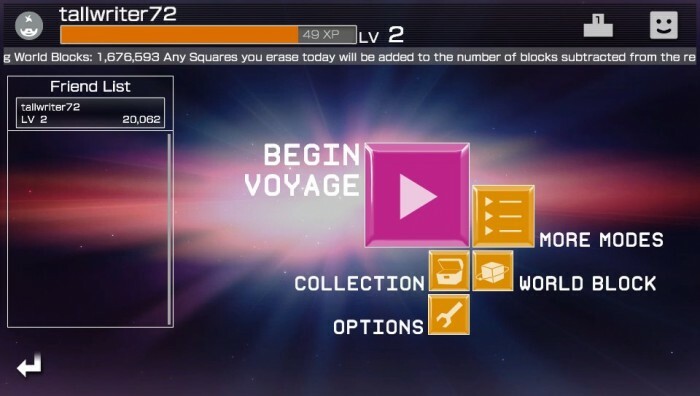 In the base voyage mode , players can last as long as possible and quit at the end or restart each time and continue progressing to each level. Players can use the playlist mode to customize their experience by matching levels/stages with music. Get a high challenge in the Master mode that features unlocked stages/ levels with quicker block drops and fewer avatar abilities. Multiplayers can challenge other players in the ad hoc Duel mode. Online leaderboards among all players and friends offer a nice statistical comparison and status. Puzzle solvers can keep classic controls throughout the gameplay, which was my default preference. Touch controls are available, but all it takes is a few big mistakes before converting back. Thankfully, game developers keep the control options open as well as creating a simple interface that keeps the focus on the puzzles and reduce player error/frustrations. Players refill their special avatar abilities by tapping the back touch pad – a considerable challenge while simultaneously using the front controls. Avatar abilities include a shuffle square where redistribution can create new hope and special squares that eliminate like, connecting colors all at once. 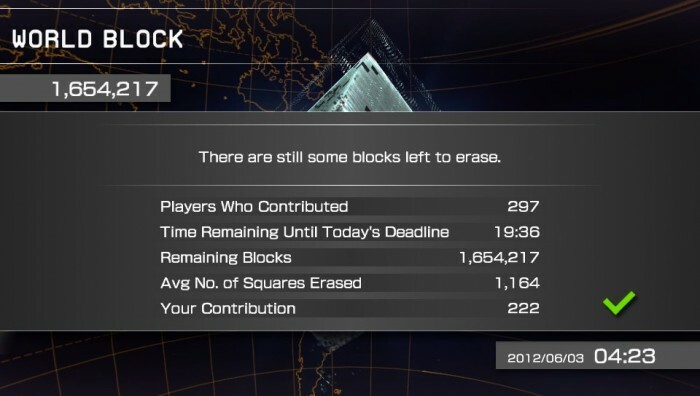 The new World Block feature puts player “contributions” into a larger 2 million square block set that resets every day. Players always have multiple ways to compare their performance on leaderboards or among friends. Game developers could have added previous Lumines installments like the original 2004 PSP game, but the new features and engaging experience overflow the satisfying puzzle game. An essential PlayStation Vita game library addition and ideal for any age group or puzzle skill set. Special note: At the time of my review, all included screen shots shown above originate from my gameplay sessions and were taken by pressing the PlayStation button (left) then the start button (right). If you try this method just make sure you are not at a critical gameplay point because you cannot use the controls while the screenshot saves. This entry was posted in Video Game Reviews and tagged Lumines, Michael Siebenaler, Mike Siebenaler, Tall Writer, video games. Bookmark the permalink.